MISSISSAUGA, ON, Jan. 9, 2019 /CNW/ - Samsung Electronics Canada recently introduced its latest innovations in modular Micro LED display technology during its annual First Look CES event at the Aria Resort & Casino in Las Vegas. The revolutionary new Micro LED technology designs featured at the event included: a new 75" display, a 219" The Wall as well as other various groundbreaking sizes, shapes and configurations for a next-generation modular Micro LED display - a 2019 CES Best of Innovation Award winner. "Samsung Micro LED technology represents endless possibilities for display innovation," said Mary Peterson, Vice President, IT & Enterprise Solutions, Samsung Canada. "Our Micro LED technology marks the beginning of the next screen revolution, providing intelligent, customizable displays that deliver the premium performance Canadians expect from their Samsung displays." Featuring leading-edge self-emissive technology and modular capabilities, Samsung's Micro LED displays deliver enhanced picture quality, versatility and design. These transformative TV displays are made up of individual modules of self-emissive Micro LEDs, featuring millions of inorganic red, green and blue microscopic LED chips that emit their own light to produce brilliant colours on screen – delivering vibrant and vivid picture quality. At last year's CES, Samsung introduced Micro LED by unveiling The Wall, the critically acclaimed, award-winning 146" Micro LED display. 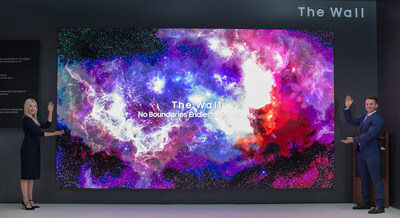 The Wall launched in Canada in 2018. Due to the technical advancements in the ultra-fine pitch semiconductor packaging process that narrow the gap between the microscopic LED chips, Samsung has now been able to create a stunning 4K Micro LED display in a smaller, more home-friendly 75" form factor. 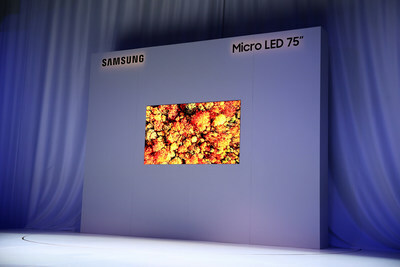 Samsung's Micro LED technology also optimizes the content to suit the size and shape of the screen. Even when adding more modules, Samsung Micro LED displays can scale to increase the resolution — all while keeping the pixel density constant. Additionally, Micro LED can support everything from the standard 16:9 content, to 21:9 widescreen films, to unconventional aspect ratios like 32:9, or even 1:1 – without having to make any compromises in its picture quality. For more detail on Samsung's 2019 QLED 8K and Micro LED lines, please visit booth #15006 in the Central Hall of the Las Vegas Convention Center during CES 2019 (January 8-11, 2019).